Conventionally, economists use gross domestic product (GDP) to estimate the sustainability of the economy and the quality of societal welfare. However, this approach is not only incorrect and logically flawed, but also in gross neglect of nature's contribution to the society. A country's economy may appear to be doing well – its GDP may be growing – but at what cost? The IWI answers this question. To do this, the IWI tracks the progress of 140 countries that make up the lion's share of the global economy ($56.84 trillion) and population (6.89 billion people). The index accounts for each country's stock of assets – its manufactured, human and natural capital – and assesses the changing health of these assets over 25 years. It's a massive dataset that covers almost an entire generation. (Fifty countries with small economies are not included in the IWI because of the difficulty in obtaining reliable data.) 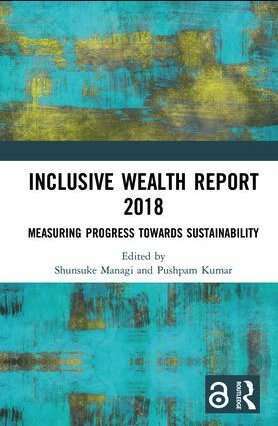 The latest IWI report shows that 44 out of the 140 countries have suffered a decline in inclusive wealth per capita even though GDP per capita increased in nearly all of the countries assessed. This means that these 44 countries are not on a path to sustainable development even if their economies, according to GDP, appear to be growing. These countries are depleting their stocks of natural, human and/or produced capital at rates that will leave future generations worse off. 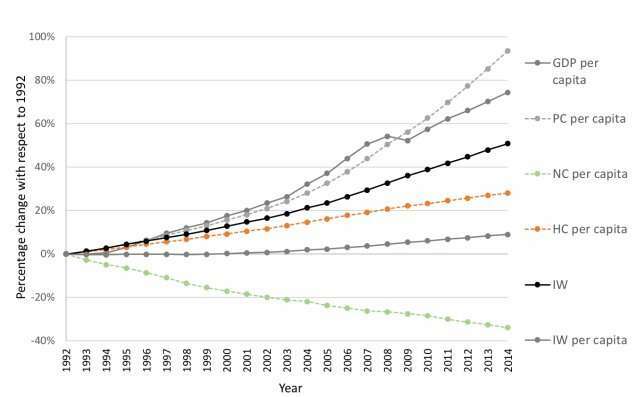 Over all, the global per capita natural capital for 1992-2014 is on decline as shown in the figure below. The key strength of the IWI is its potential to serve as a metric for sustainable development policy. By highlighting the existing productive base in a country, whether that base is used to achieve economic, social, and environmental goals, the index can help policymakers target investments and recognize the policy and resource trade-offs associated with decisions regarding sustainable development. With the advent of the SDGs, now more than ever, countries need to step up their work to strengthen environmental accounting and, consequently, become better able to use the IWI as a tool for policy change. By measuring natural wealth—an untapped and underappreciated wealth stock—we can move one crucial step closer to recognizing natural capital's contribution to and impact on achieving sustainable development.